In this special guest post, Axel Huebl looks at the TOP500 and HPCG with an eye on power efficiency trends to watch on the road to Exascale. SC18 is in the books now and the latest TOP500 results are out. Perfect time for some play with numbers! This post will focus one efficiency, in terms of performance per Watt, simply because system power envelope is a major constrain for upcoming Exascale systems. With the great numbers from TOP500, we try to extend theoretical estimates from theoretical Flop/Ws of individual compute hardware to system scale. Since recently, an additional benchmark complementing raw LINPACK performance (TOP500 metric) on systems was introduced called HPCG. The High Performance Conjugate Gradients benchmark project computes a conjugate gradient (CG) method which is contrary to the dense matrix operations in LINPACK a sparse task. Why would this be interesting? Besides the official list of reasons on the project page and the use of the method itself for e.g. solving long-range potentials, CG is a good measure for many kinds of finite stencil-based codes such as fluid solvers, FDTD solvers, finite element solvers and the like. CG is, contrary to LINPACK, quickly memory bound and reasonably communication intensive at scale, just like most real-world science problems. That means for a system benchmark, well-designed networking and per-node performance (fat nodes) get a bigger role in order to push down latencies. Last but not least, as far as I am aware, CG does not benefit from the recently introduced tensor coresin Nvidia’s Volta generation. (Simply because those cores are also made for dense matrix-matrix operations and packing overhead and reduction of parallelism in blocks does not play well when also calculating a lot of zeros.) LINPACK, or to be more precise the multi-node implementation HPL, does not use tensor cores yet either, but research is done in that field. So all-in-all, HPCG as the Flop/s measure for an energy comparison seems to be an exciting and somewhat fair starting point to look at. So let us take the official HPCG list and calculate a “Green HPCG” from it. Why should LINPACK be the only metric for Flop/s and efficiency? This “unofficial” list is just like the official Green500 list, but swapping LINPACK Flop/s for HPCG Flop/s. Of course, data was not complete: not all HPCG (and even TOP500) candidates submit power and not all Green 500 listings have a HPCG submission. MareNostrum P9 CTE with 327 MFlop/Ws! A system at rank 411 in the TOP500! Positioned slightly before AI Bridging Cloud (309 MFlop/Ws) and Summit (299 MFlop/Ws). Sierra is on place four with 241 MFlop/Ws – interesting difference for a Summit-twin. The list goes on with recent GPU systems until Xeon Phi (MIC) kicks in at 142 MFlop/Ws for Oakforest-PACS and the best x86 system, BSC with MareNostrum again (! ), with 75 MFlop/Ws. Notes: Some systems are mixed, e.g. JURECA (11/2017 upgrade) has Kepler GPUs (2015) and Xeon Phi accelerators (2017), which is categorized as “GPU” arch (probably wrong categorization and likely benchmarked for a sub-system). For SuperMUC-NG, no official power-numbers are yet available, maybe 3-6 MW are likely (estimating 69-35 MFlop/Ws). The top places are taken by Nvidia P100 & V100 GPUs, likely due to two reasons: a significant efficiency improvement in Pascal and Volta and (finally) the launch of multi-accelerator nodes in large systems. On the second group is taken by (2017) MIC systems. I tried to group by “launch” of systems in TOP500 submissions, looking at an evolution over time. One can see that there was already a significant gap in 2016/17 between the two which has now been widened with Knights Hill being canceled and Knights Mill (likely also a LINPACK/ML focused hardware) not yet released. As a little surprise, the RISC architecture SPARC64 which launched in year 2011 is still amazingly well positioned. Even today, it is close to recently built x86 systems. Let’s see where the upcoming A64FXwill be heading. Sunway’s SW26010, introduced in 2016, is surprisingly low in our little comparison. General purpose RISC architectures are leading in this comparison even more than in the official Green500. In that sense, it would be really interesting if a power consumption number was submitted for Sandia’s Astra (Cavium ThunderX2) cluster. But either way, is our comparison fair? Likely not more than any other metric for calculating efficiency. 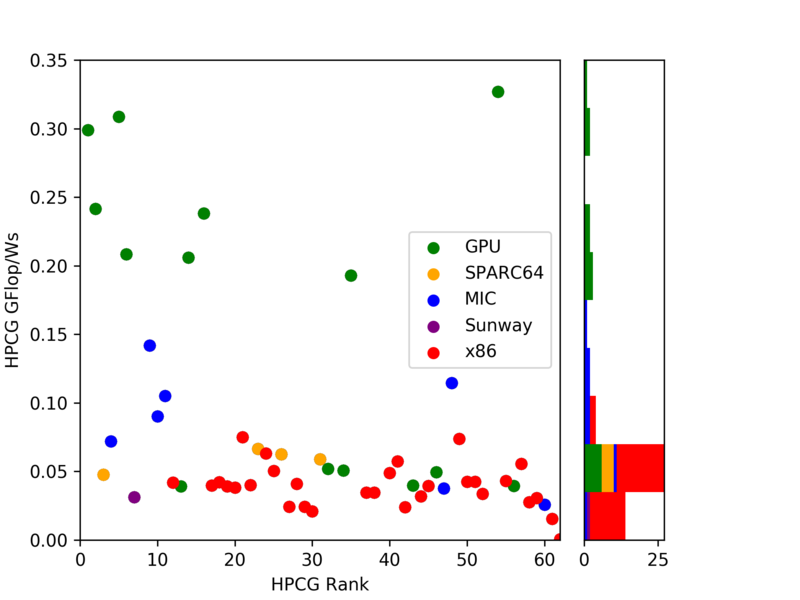 But let’s assume that most scientific HPC applications lie somewhere between the official LINPACK and HPCG benchmarks, so we should consider both metrics for efficiency as well. 2018-11-18 3:38PM (CET): Avoid implying that HPL is able to use FP16 tensor cores already for TOP500 benchmarks. Clarified with an additional sentence and link to a recent paper, thanks Timothy! Axel Huebl is a computational physicist who specializes in next-generation, laser plasma-based particle accelerators. Huebl and others reinvented the particle-in-cell algorithm to simulate plasma-physics with 3D simulations of unprecedented detail on leadership-scale many-core supercomputers such as Titan (ORNL). Through this line of research, Huebl also derives models to understand and predict promising regimes for applications such as radiation therapy of cancer with laser-driven ion beams. Interacting closely with experimental scientists, their simulations are showing that plasma-based particle accelerators may yield numerous scientific advances in industrial and medical applications. Huebl was part of a team that were Gordon-Bell prize finalists at SC13. How to Measure a Supercomputer’s Speed?